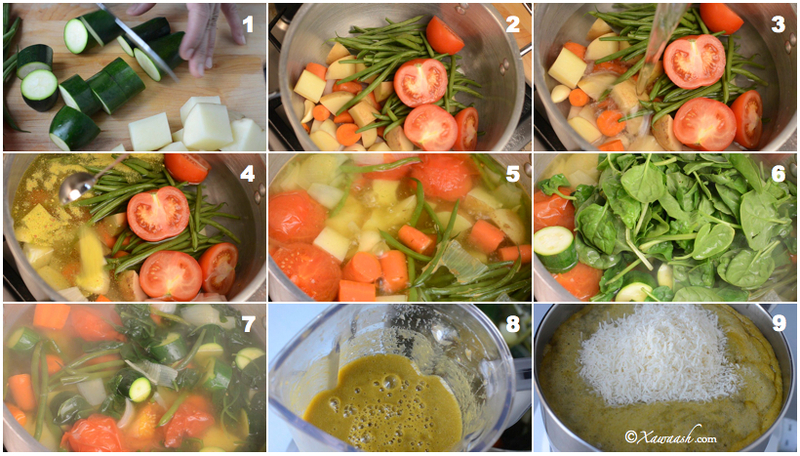 We learned how to make this soup from Hooyo¹ Fadumo Abdulle (Abdullahi’s mother). Hooyo Fadumo is an amazing cook but her story with cooking did not have the greatest start. Actually, it began with an embarrassing experience. 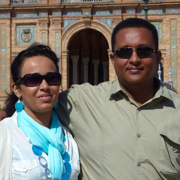 Even though born and raised in Mogadishu, she comes from a family of pastoralists (reer miyi). At 19 years of age and a newlywed, she knew nothing about the culture of her Bravanese husband. The job of preparing Bravanese foods was entrusted to a cook and things went smoothly until the day when the cook suddenly announced that she was leaving. Even though Hooyo Fadumo had never shown any interest in learning how to cook Bravanese food, she just shrugged it off. She told her husband (Abdullahi’s father) that there was nothing to worry about and that she can handle everything herself. She had seen the food preparation from a distance, but nevertheless, she felt very confident. Somalis have a phrase for this: waan daadshay (I am a master at it). It has resulted in many a disaster! The next morning, she asked a relative to buy her “the fish with the small eyes and the little tail.” She remembered that the cooked fish was scored and she scored hers. She put a little oil in a cold pan and without waiting for it to heat up, she placed the fish in the pan. She kept flipping the fish but after 15 minutes, it was still soft. Unperturbed, she put the fish on a plate and with the biggest smile she could manage, placed it on the table in front of her husband. That marked the beginning of a journey with food and it culminated in her becoming a stellar cook. Nous avons appris à faire cette soupe avec Hooyo¹ Fadumo Abdulle (la maman d’Abdullalhi). Hooyo Fadumo est une très bonne cuisinière mais son histoire avec la cuisine a eu des débuts difficiles. En fait, elle commença par une expérience embarrassante. Bien que née et élevée à Mogadishu, elle vient d’une famille de pasteurs (reer miyi). A 19 ans et jeune mariée, elle ne connaissait rien de la culture de son mari Bravanais. La tâche de préparer les plats Bravanais revenait à la cuisinière et tout ce passait bien jusqu’au jour où la cuisinière annonça subitement qu’elle quittait son poste. Même si Hooyo Fadumo n’avait jamais montré d’interêt à apprendre à cuisiner la nourriture Bravanaise, elle ne s’inquiéta pas. Elle dit à son mari (le papa d’Abdullalhi) qu’il n’avait pas à s’inquiéter et qu’elle pouvait s’en occuper toute seule. Elle avait assisté à la préparation de la nourriture de loin, mais toutefois elle se sentait très capable. Les Somalis ont une expression pour ça: waan daadshay (je gère). Il s’en est suivi de nombreux désastres! Le lendemain matin, elle demanda à un proche de lui acheter “le poisson avec les petits yeux et la petit queue”. Elle se rappelait que le poisson cuisiné était incisé et elle ouvrit le sien. Elle mit un peu d’huile dans une poêle froide et sans attendre qu’elle chauffe, elle posa le poisson dans la poêle. Elle retournait sans arrêt le poisson mais après 15 minutes, il était toujours cru. Imperturbable, elle mit le poisson sur une assiette et avec un grand sourire, le présenta sur la table devant son mari. Il le piqua avec sa fourchette et réalisa que les entrailles n’avaient pas étaient retirées du poisson et le lui dit. Elle répondit: “Les poissons ont des entrailles?”. Elle se sentit très embarrassée et cette nuit là, dans son lit, elle se jura, “Plus jamais!” C’était le début de son histoire avec la nourriture et elle culmina lorsqu’elle devint une cuisinière stellaire. 1. 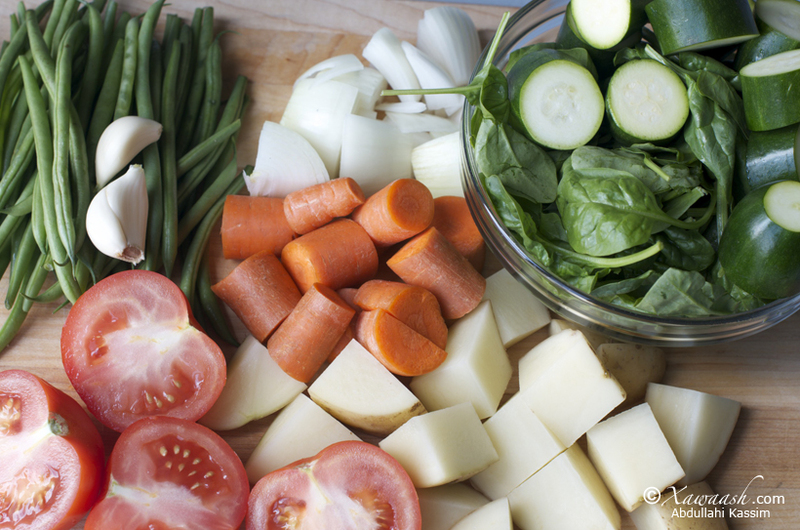 Cut the vegetables into large chunks. 2. 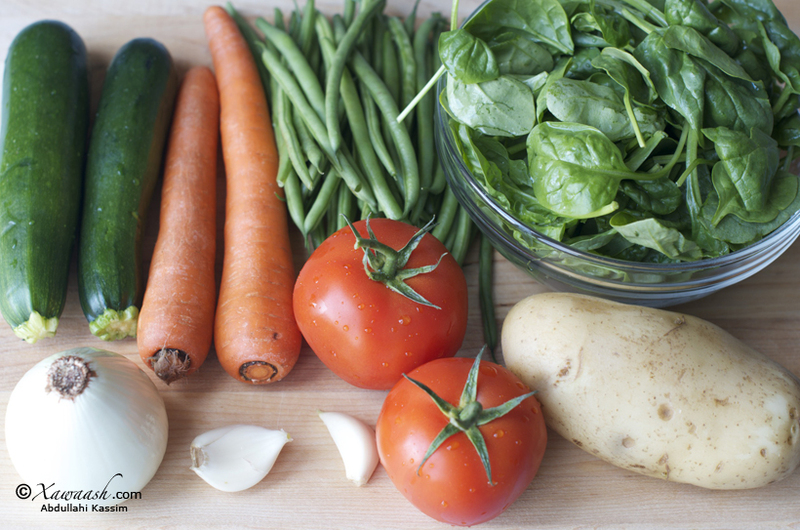 Place the vegetables, except the spinach and zucchini, in a 6-litre pot set on medium heat. 3. Add 2 litres of water. 4. Add the Vegeta or the bouillon cubes. 5. Cover and cook for 15 minutes on medium heat. 6. Add the spinach and zucchini, then cover and cook for 5 minutes. 7. Let the vegetables cool down before blending. 8. For best results, use a countertop blender. Blend in batches and make sure that the soup is not hot. 9. If you wish, add milk or heavy cream and grated parmesan cheese. Heat and serve. 1. Qudaarta gaballo waaweyn u-jarjar. 2. Digsi 6 litir qaada ku-rid. Ha ku-ridin isbinaashada iyo zukiinida. 3. Ku-dar 2 litir oo biyo ah. 4. Ku-dar maraq qudaarta Vegeta ama mukacabbaatka Maggi ama Knorr. 5. Dabool oo dab dhexdhexaad ah ku-kari muddo 15 daqiiqo. 6. Ku-dar isbinaashada iyo zukiinida. Dabool oo 5 daqiiqo dab dhexdhexaad ah ku-kari. 7. Dhig oo ha-qaboowdo qudaarta karsan. 8. Markay qaboowdo, kiskis u-shiid. Waxay ku sii fiican tahay in khallaat lagu shiido. 9. Haddaad jeceshahay, caano ama kareemo ku-dar. Waxaa kaloo ku-dartaa farmaajo parmijaano la-xoqay. Barooddada kululeey intaadan qaddimin. 1. Couper les légumes en gros morceaux. 2. Mettre les légumes, sauf les épinards et les courgettes, dans une marmite de 6 litres à feu moyen. 3. Ajouter 2 litres d’eau. 4. Ajouter le Vegeta ou les bouillon cubes. 5. Couvrir et cuire pendant 15 minutes à feu moyen. 6. Ajouter les épinards et les courgettes, puis couvrir et cuire pendant 5 minutes. 7. Laisser les légumes refroidir avant de les mixer. 8. Pour de meilleurs résultats, utiliser un blender. Mixer en plusieurs fois et s’assurer que la soupe n’est pas trop chaude. 9. Si vous le souhaitez, ajouter du lait ou de la crème fraîche et du parmesan râpé. Réchauffer et servir. Adigaa mahadda mudan walaal. Qeyr badan ayaan kuu rajaynaynaa. Mahadsanid. Even College student like myself can prepare this. Easy and affordable. Thank you guys so much and may Allah bless you guys in this life and the hereafter. You are most welcome. We are trying to cover the traditional recipes and some of them have many steps. However, we hope to post many easy and tasty recipes that are suitable for students. Thank you for the comment. Thank you for posting this amazing and healthy dish. I personally was looking for how to make soups these days. I even borrowed some soup recipe books from my local library. In our culture (Somalians) we don’t have many vegetables or soup dishes. Thank you again and I hope you would post some more soup dishes in the future Isha-Allah. Jizzkallah Khayra Jizaa. Thank you for taking the time to comment and thank you for letting us know your recipe preferences. 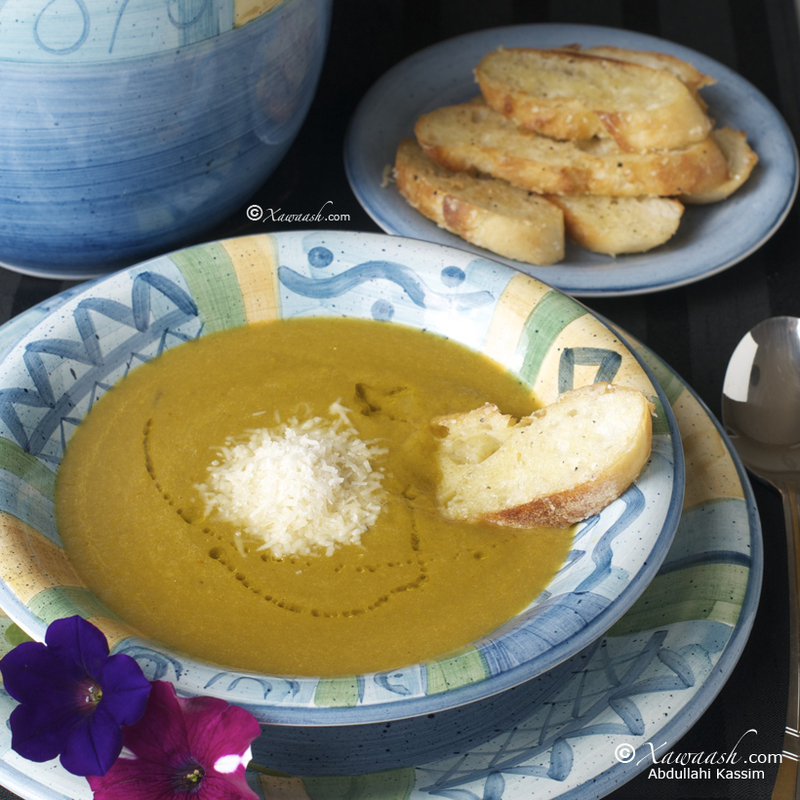 We have a lot of soup recipes we hope to post in the near future. A&L, salaan sare iga gudooma. Runtii waa shurbo aad u fiican,fududday kariskeeddu islamarkaana nafaqadeedduna sareyso. Waxaana sharaf ii ah in si joogto ah cunto karinta uga barto kulliyadan All xawaash. Waad ku-mahadsan tahay salaanta wacan. Waxaan ku-faraxsannahay inaad u-riyaaqday Xawaash. Waxaan rajeynaynaa inaad jeclaato waxyaabaha kale aan soo gelin doonno. Mahadsanid. Asc wr wb? aad iyo aad ayaad u mahadsantihiin mahad aan lasoo koobi karin. Iga raali ahaada markasta waxaan is dhahaa bal qoraalka badan ka dhaaf aad ayay u mashquulsanyihiine hadana waxaan is arkaa un anigoo iska celin kari la’ oo wax qoraaya kuna dhahaaya naftayda maadaama aysan jirin wax kalood ugu abaal gudo ha kala bakhaylin mahadnaq inaad u gudbiso. Marka aad ayaan idiin salaamayaa waxaa kaloon salaamayaa hooyo Faadumo anoo idinka codsanayaa inaad naga gaarsiisaan salaan aad u qiimo badan, anoo ku hadlaaya magaca bahda Xawaash, aadna aan ugu faraxsanahay sheekada ay nala wadaagtay iyo maraqa caafimaadka badan karistiisuna ay fududahay. Khayr aan dhamaan iyo caafimaad taamm ah Illaahay ha siiyo hooyo Faadumo iyo idinkaba aamiin. Waad mahadsantihiin mar labaad iyo mar sadexaadba. Wa fii amaanilaah. Adigaa mahadda mudan walaasheenna qaaliga ah. Waad ku-mahadsan tahay sida joogtada ah aad noo xiriirisid. Waan jecelnahay qoraaladiinna, waana ku-mahadsan tihiin waqtigiinna qaaliga ah oo aad wax inoogu soo qortaan. Hooyo Faadumo salaanta wey idinka guddoontay waxayna idin leedahay waa inoo sheekooyin dambe oo badan. Maashaa Allaah. Can’t wait, gacmo furan ayaan kusoo dhawaynaynaa waliba anagoo aaaaad u xisaynyna. Waad ku-mahadsan tahay faallooyinkaada. Hadduu Eebbe idmo waan soo gelin doonnaa rootiga dhaadheer. Mahadsanid. Hadduu Ilaahey yiraahdo waan soo gelin doonnaa ee wax yar inoo samra. Assalamu alaikum, I just discovered your page today and I am in love. May Allah reward you both for taking the time to post these. I can’t wait to try this recipe tmrw. Thank you again and keep up the good work. Welcome on board. Thank you for taking the time to comment. Salaam Alaikum A&L! Ramadaan Kareem! May Allah accept our fasting. Thank you so much for all the new recipes. Waxa ku faraax sanahay xawaash.com! I smile the whole day when I visit your website! Thank you so much for letting us know how much you like xawaash.com. You put a big smile on our face. God willing, we will do our very best to keep posting recipes that we hope you will like. I love creamy soups and can’t wait to try this one. Its Somali name sounds a lot better:) I’m not a big fan of zucchini and green beans, but I know their nutritious value and this is an excellent way to sneak them into my diet:) I’ll try a simple version and one with coconut milk. Thank you so much for sharing the recipe. The name ‘borooddo’ comes from the Italian word ‘brodo.’ Somalia was an Italian colony, therefore the Italian loan words. You can use any vegetables of your choice. However, based on our experience, the essential ingredients are beans and potatoes. They make the soup taste creamier. We normally use mung beans instead of the green beans and the soup turns out delicious. We didn’t have any in our pantry when we were making the soup. I am having this soup right now, it is simply amazing! I used coconut milk to keep it vegan and it turned out so delicious. I wouldn’t change anything to it, all the vegetables are used in the right amount to create this gorgeous flavour. It takes so little to prepare them and to cook the soup, that I’ll surely be making it again. Many thanks Hooyo Fadumo for passing on this recipe and thank you Abdullahi and Leila for sharing it. Thank you very much for sharing your experience with us. It sounds amazing. We will try it with coconut milk next time. ASc,Thanks alot of the new recipes May Allah bless you,Ramadhan kareem!!! Ramadan Karim! Thank you for taking the to comment. What a nice soup! Thank you very much. I feel nourished and enjoyed the taste and ease of doing it. Thank you for the nice comment and for your confidence in our recipes. Thank you very much for your nice compliment. God bless you. All I can say is, ducadaan Allaha idiin aqbalo. Shaqadaad heysaana waa mid sharaf leh, lagana faa’iidaayo. Walaalayaal for the sake of the generations to come, please publish this work. Aad ayaa ugu mahadsan tahay faallada xamaasadda leh. Hadduu Ilaahey yiraahdo waxaan ku-dadaalaynaa inaan e-book ka-dhigno. Mahadsanid walaal. after many many tries, i finally got it right.thank you so much.because of your reciepe my children love eating.so thank you! You are most welcome. We are happy we could help. Thank you for your comment. se malagu darayaa , hadii lagudarayo biyo ilaa intee inleeg baalagudarayaa ,walalayaal run ahaantii aad baan suaalaa idiin ku badiyee aad iyo aad raali iiga ahaada ilaahay raali haydin ka noqdee walalayaal wasalaama calaykum waraxmatulaahi wa barakatu. Walaal Roda, waan ku faraxnay faallada qiimaha badan aad inoo soo qortay. Adigana qayr badan ayaan Eebbe kaaga baryaynaa. Midda koowaad su’aalaha badan waan jecelnahay, sababtoo ah waxaan ku ogaannaa inaad isticmaalaysiin website-ka. Midda labaad qudaarta biyihii lagu kariyay oo dhan ayaa lagu shiiday, kaddibna caanaha caadiga ah ama kuwa subaga wax yar laga saaray 2% ayaad ku darsan kartaa. Biyo kale uma baahna in lagu daro. Haddaad su’aal kale qabtid nala socodsii. Mahadsanid walaal. asc wr wb walalyaal runtii ma aqaan waxaan idiinku abaalgudo dadaal kiina iyo hawl qabadkiina maaha wax la soo koobikaro runtii aad baad noo farxad geliseen ilaahay haydika farxiyo oo haydinka raali ahaado khayr iyo guul iyo farxad baan idiin rajeynayaa walaalayaal dadaal kiinana halkaa ka siiwada wsc wr wb . Inaad ka faa’iidaysataan oona ku faraxasan tihiin ayaa abaalgud inoo ah. Adigana intaad noogu ducaysay iyo in ka badan ayaan Ilaahey kaaga baryaynaa. Aad iyo aad ayaa u mahadsan tahay. Bisinka walaahi waa ka cabsoo. Delicious cajiib ah oo hadana aan dhib laga mareeynin waaye. Thanks guys I love this website walaahi. So far waxaan bartay 2 ditsh. Maraqan iyo bariis udgoon. Out come waxuu noqday very very very delicious. I try another ones soon. Aad iyo aad ayaa u mahadsan tahay walaal. Waan ku faraxnay inaad jeclaatay.